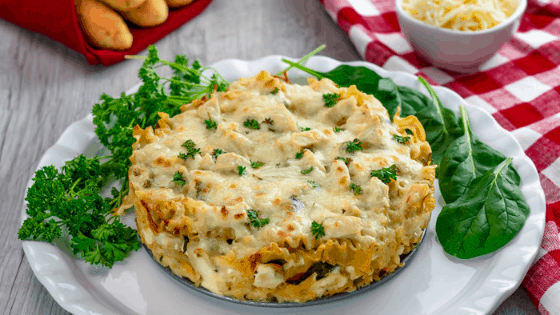 Creamy White Chicken and Spinach Lasagna layered with white sauce, ricotta cheese, and spinach made in the Instant Pot. For this recipe, you will need either a springform pan or a push-up pan. You will need to grease all sides and the bottom of the pan so that your noodles and other layers of lasagna will not stick! The Instant Pot is used primarily to make this lasagna, however, I do use my broiler to brown the top of my white chicken and spinach lasagna. You can skip this step if you would like and serve it right from the Instant Pot! This recipe has enough servings for 4 people. You can stack two of these pans in your Instant Pot and make two of these at a time if you would like! The cook time and the liquid time does not change! That’s one of the wonderful things about the Instant Pot, there aren’t really any changes when doubling food in the Instant Pot and I especially love that it doesn’t take longer to cook! Since the Instant Pot uses pressure to cook food, it’s best not to use dairy products in the actually pressure cooking part of the process. Dairy under pressure tends to curdle and seperate and while it’s still safe to eat, it is unpleasing to the eye. You can use other alternatives to milk other than soy milk based on your preference. White chicken and spinach lasagna made in the Instant Pot. Set oven to broil. Use the broiler if you want the top of your lasagna to have a crispier texture. You can skip this step if you wish. Set Instant Pot to SAUTE and add in the 1 tbsp of oil. Add diced chicken breasts to the Instant Pot and cook until all sides are no longer pink. Remove from pot. Add in the 2 cups of chicken broth. Add basil, oregano, and black pepper. Add in 2 cups of Mozzarella cheese and 1 cup of Parmesan cheese. Stir and allow cheese to melt. Remove from pot and clean the inner liner of the Instant Pot. In a 7" springform pan, grease all sides with nonstick cooking spray. Add 2 cups of Mafalda noodles to the bottom of the pan, spreading evenly. Add half of the cheese sauce you made in the Instant Pot on top of the noodles evenly. Layer half of the cooked chicken on top of the cheese sauce. Layer 3/4 cups of the ricotta cheese on top of the chicken. Sprinkle the 1 cup of chopped spinach evenly over the ricotta cheese. Once again, layer the noodles, cheese sauce, chicken, and ricotta cheese. Top the rest off with remaining mozzarella and Parmesan cheeses. Cover springform pan with aluminum foil and set on a sling. Add 1 cup of water to the Instant Pot and add sling with pan into inner liner. Close the lid and vent and cook for 20 minutes. Allow to release pressure for 10 minutes and remove from Instant Pot. If using the broiler method, remove the aluminum foil from pan and set in the oven for about 3 minutes or until the top of the lasagna starts to brown and bubble. Unlock the springform pan and lift from lasagna, sprinkle with parsley if desired. Serve. I didn’t see where you used the broth or herbs. Added that step! Thanks for catching that! This looks amazing! Do you cook the noodles before putting the lasagna together? This looks amazing! Do you cook the noodles before putting he lasagna together? I used a 7inch springform pan for this recipe and I could not get all the ingredients to fit. My sauce was running over the sides, I had to leave some out It’s currently in the pressure pot so I’m hoping it turns out, the sauce has a great flavor. It could be the height of your pan 🙂 Glad you like the sauce!